(Lithia, FL – April 13, 2016) – CONCEPT Professional Training, a global leader in online professional training in forensic mental health, announced today that it will host a free live webinar titled “Comparing two Primary Methods for Assessing and Managing Violence Risk: Actuarial Risk Assessment versus Structured Professional Judgment“, on Wednesday, June 8th from 1:00pm – 2:30pm EST. This webinar will offer expert advice from Dr. Stephen Hart, as well as an overview of the differences between these methods and the implications of these difference for both practice and the law. Dr. Hart is one of the leading experts in the forensic field that focuses on risk assessment, threat assessment, and workplace violence. This Live webinar is intended for professionals that want to enhance their understanding in threat assessment and risk management, including those working in criminal justice, security, health care, social service, education, and human resources settings. 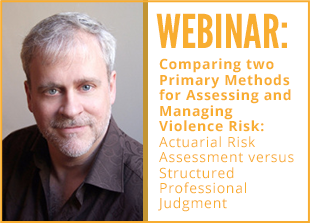 For more information on Comparing two Primary Methods for Assessing and Managing Violence Risk: Actuarial Risk Assessment versus Structured Professional Judgment, visit here. For a full list of all the Wednesday Webinars, visit the information page.